I first learned about making my voice heard as a young girl growing up in San Jose, California. I vividly recall hopscotching in front of a sign my parents put on our front lawn that read, “Save Our Schools: Vote NO on Prop 13.” While I didn’t know exactly what Prop 13 was, I had an idea what “Save Our Schools” meant. And I knew that my education was important to my parents. I figured out that they had something to say about the future of California’s educational system, and through voting, they were going to stand up, be counted, and have their voices heard. In the mid-80’s as I was entering college, I remember reading about the Latino community being portrayed as “the sleeping giant.” I was intrigued. The media was acknowledging the growth of the Latino population in California, and they were noting the potentially immense political power of this community. Also noted was a tremendous barrier for the Latino community in realizing this power themselves which was the overall lack of Latinos standing up to be counted at election time. Low voter registration and turnout rates were cited as evidence that this demographic behemoth had not realized its full potential at the polls. Fast forward 20 years and we still haven’t fully awakened the sleeping giant. Each year, millions of eligible voters forgo their right to vote by either not registering to vote in time, or by simply not casting a ballot. In 2012, the last time our nation had a non-incumbent Presidential election, nearly 1 in 4 eligible Americans were not registered to vote. Of those eligible and registered, only 55 percent actually voted. In that same election, only 48 percent of eligible Hispanic voters turned out to vote, down from nearly 50 percent in 2008. This needs to change. Especially this year, when our electorate will be more ethnically diverse than ever before and the anti-immigrant agenda is center stage at the national level. Recent data from the Pew Research Center indicates that nearly one-in-three (31%) of eligible voters on Election Day 2016 will be Hispanic, black, Asian or another racial or ethnic minority, up 2 percent from 29% in 2012. This is great news, but the more important component is getting everyone to show up and actually vote. The Pew research also showed that there is a relatively lower turnout rate among Hispanic voters. In fact, in the 2012 presidential election, 64% of non-Hispanic white eligible voters cast ballots, while the voter turnout rate was only 48% among Hispanics. In California, many analysts are predicting a huge voter turnout in California’s upcoming Primary Election on June 7, with early voting by mail having already started. So far, more than 850,000 residents have updated their information or registered to vote in 2016 – that is an impressive number. According to Pew, it is estimated that approximately 28 percent of California eligible voters are Hispanic, the third largest Hispanic statewide eligible voter share nationally. There has been a doubling of registration growth among Latinos since January 1, 2016. 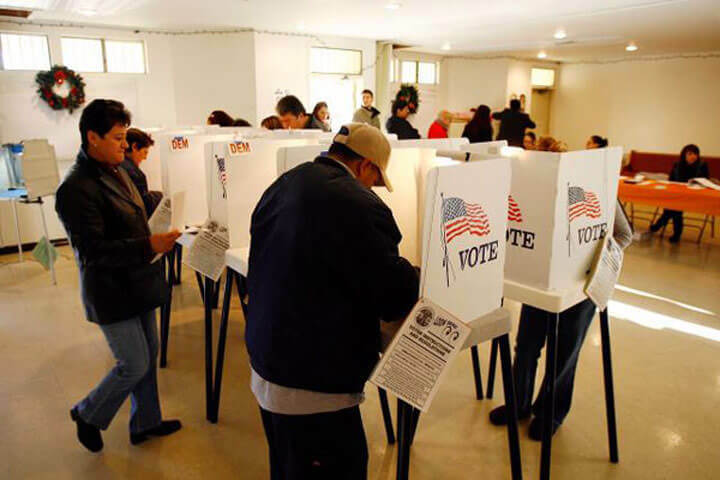 This year, the National Association of Latino Elected and Appointed Officials (NALEO) projects the nationwide Hispanic voter turnout to be 13.1 million voters, up from 11.2 million in 2012. And let’s not forget that millennials will account for nearly half (44%) of the record 27.3 million of eligible Hispanic voters projected for 2016 – a share greater than any other racial or ethnic voting group. If we don’t participate in the electoral process, we are missing a huge opportunity to make our voices heard. We need to encourage those within our community to register and make it a priority to actually get out and vote (or send in an absentee ballot by mail). Beyond the Presidential candidates, there are a number of local, state, and federal representatives up for re-election this year, as well as propositions – all of which will have an impact on every one of us. When we DO exercise our right to vote, the impact of having Latinos in positions of power is palpable. Thanks to Latino leaders in the state legislature, bold new initiatives are advancing. Just this week, a new law went into effect that provides health care coverage for all children, regardless of immigration status. This presidential election will be critical for setting the tone for the Latino and immigrant community into the future. We will have the opportunity to see whether or not “the sleeping giant” has finally awakened to realize its full potential. I’m urging all eligible voters, regardless of race, gender, party preference, etc., to register to vote before the May 23, 2016, registration deadline in order to vote in the June 7, 2016, Primary Election. You can register to vote online by clicking here (www.registertovote.ca.gov). Learn more about Primary Election and what will be on the ballot by clicking here (http://voterguide.sos.ca.gov/). Voting is one of the most important mechanism for Latinos and all Americans to make their voices heard. See you at the polls!